Should More Companies Adopt Flexible Dividend Policies? In the U.S. and U.K. markets, the most common form of dividend policy is one that aims to pay at least the same amount year after year, regardless of the company's performance that year. I'll call this the "consistent" dividend policy. In such a system, a dividend increase is typically seen as a positive thing -- a sign that the company expects profitability to improve in coming years. Conversely, a dividend cut is usually a negative -- a sign that the company has run into trouble and needs to shore up cash. Indeed, a number of companies have run into trouble desperately trying to maintain the historical dividend level -- borrowing, selling assets, etc. -- when the logical thing to do would have been to reduce the dividend payout until things got better. An alternative approach is the "flexible" payout policy in which a company establishes that it will pay a certain percentage of earnings or free cash flow each year. The payout amount could fluctuate up and down, but it relieves the company of having to worry about maintaining a certain payout each year. I see benefits and drawbacks to both approaches. In the end, I think it depends on the nature of the company's business and the precedent that it has set with shareholders. U.K.-based Rotork, for example, operates in a cyclical industry and smartly implements a flexible dividend policy that incorporates a "core" dividend that grows in line with earnings plus an "additional" dividend in particularly good years. If the company runs into a bad year, the total payout may be lower than the previous year, but shareholders will likely be more accepting of that since the policy has been clearly communicated and consistent. On the other hand, Procter & Gamble (a stock I own) operates in a more defensive industry and has paid an increasing dividend for 56 years. As such, its shareholders expect a consistent (and rising!) payout each year. A lower dividend would be disastrous signal. All that said, many large companies with consistent dividend policies also practice flexible distribution policies -- it's just that they substitute buybacks for cash dividends to bridge the gap. 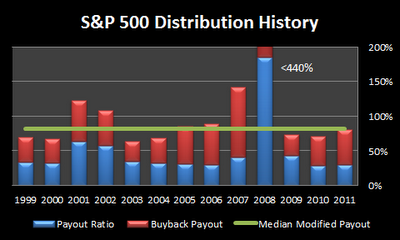 In other words, they maintain a consistent dividend policy and adjust to the business climate using buybacks. As the chart below shows, since 1999 the modified payout (dividends + buybacks) has fluctuated quite a bit, but the median modified payout has been about 82%. U.S. companies are paying out most of their earnings over the business cycle, just not with dividends -- the median dividend payout ratio over the period is 35% with the balance going to buybacks. If anything, then, investors who prefer a flexible dividend policy should be demanding that companies use a greater percentage of actual dividends in their distribution policies (i.e. a normal + special dividend policy). I think there's a good case for that. What's your take? Have a suggestion for future posts? Please post your comments below. Are You a Better Investor Than Fund Managers? Earlier this week, I came across an interesting study by Andriy Bodnaruk of the University of Notre Dame and Andrei Simonov of Michigan State University, entitled "Do Financial Experts Make Better Investment Decisions?" The pair analyzed the personal portfolios of 84 Sweden-based fund managers and compared them those of non-professional peers that had similar backgrounds as the fund managers. We find no evidence that financial experts are making better investment decisions than their less financially astute peers: they do not outperform, do not diversify their risks better, and do not exhibit lower behavioral biases...Our results demonstrate that day-to-day knowledge of financial markets does not improve investment decisions. We find that financial experts do not exhibit superior security picking ability in their own portfolios. Private investments of fund managers perform on par with investments of investors similar to them in terms of age, gender, education level, income, and wealth. Even more striking, mutual funds managers’ investments perform worse than private investments of wealthiest 1% of investors. Moreover, non-MF-related investments of managers significantly underperform their MF-related investments. This suggests that a part of overall managerial performance should be credited to access to fund’s resources. Our results can be best summarized in the following way: day-to-day knowledge of financial markets is of little value for investors with a high level of general intelligence – both managers and their peers are among the most educated and wealthy investors. It is plausible that marginal effect of financial expertise on investment decisions is trivial for these investors, but is of larger importance for less sophisticated individuals. Our results, nevertheless, provide important insights as they demonstrate that there are limits to the value added by financial expertise. In other words, financial literacy and a fair level of intelligence are still essential if you plan on investing on your own. You have to want to continuously learn about investing and keep up with your investments. Some people don't want to learn, and that's fine, but that group should probably outsource their investment management to professionals anyway. Assuming that we have the requisite intelligence, knowledge, and motivation to manage our own investments, however, this study is indeed encouraging to individual investors. If I've learned one thing in my investment career, it's this: superior investing results require superior decision-making skills. You can have access to all the information in the world, but at the end of the day the information isn't worth much if you're not using it to make better decisions. Great analysts don't necessarily make for great investors, and vice versa. Great analysts are great information gatherers and interpreters; great investors are great decision-makers. After you've established a good foundation of investing knowledge, the next step is to understand investing psychology, behavioral finance, and risk. In fact, I've learned more about making smart investment decisions from these three books as I have in all the accounting and financial theory books I've read. If you haven't read one or any of these, I can't recommend them enough. I find myself re-reading them again and again to let the lessons sink in. The better you understand yourself -- what's behind your decision-making process, what triggers emotions, and the lessons learned from previous mistakes -- the better investor you'll be. I do believe that the non-financial professional with street smarts, self-awareness, and a solid financial foundation can achieve excellent long term returns. P.S. If you'd like to receive an email whenever a new blog is posted, please enter your email in the box at the top right-hand corner of the screen.